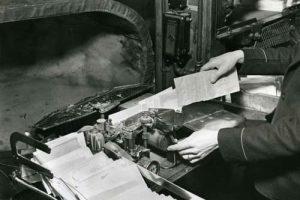 John Palmer revolutionised the journey of a letter with the introduction of the mail coach. Assistant Curator Georgina tells the story of the founding father of the British system of mail coaches and shares her favourite stamps and paintings of the coaches from our collections. 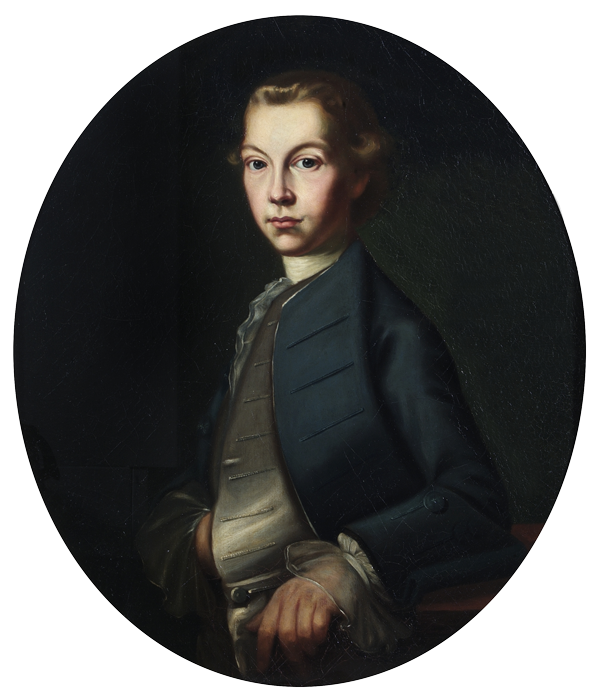 John Palmer was born in Bath, Somerset and after his education joined his father in the theatre business. 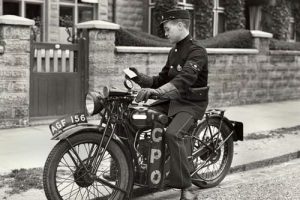 He used post-chaise to move actors and scenery quickly between theatres and it was this concept that he thought could benefit the postal service. It was agreed by William Pitt that a test run could be enacted on the 2nd of August 1784, at Palmer’s expense. 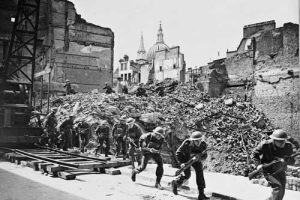 It ran between Bristol and London and was completed in 13 hours rather than the 36 it had previously taken. 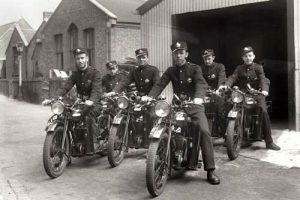 Due to the success of the trial more routes were opened up across the country. The mail coaches travelled at a speed of around 7 to 8 miles an hour and changed horses every 10 to 15 miles. 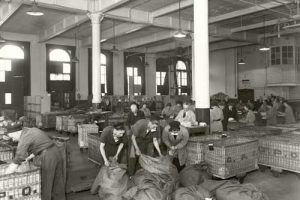 The coaches also had space for passengers which increased revenue for the contractors that supplied the vehicles. 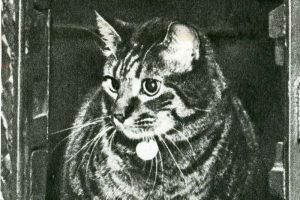 It wasn’t until the increase in rail links that the mail coach dwindled and eventually ceased to exist. 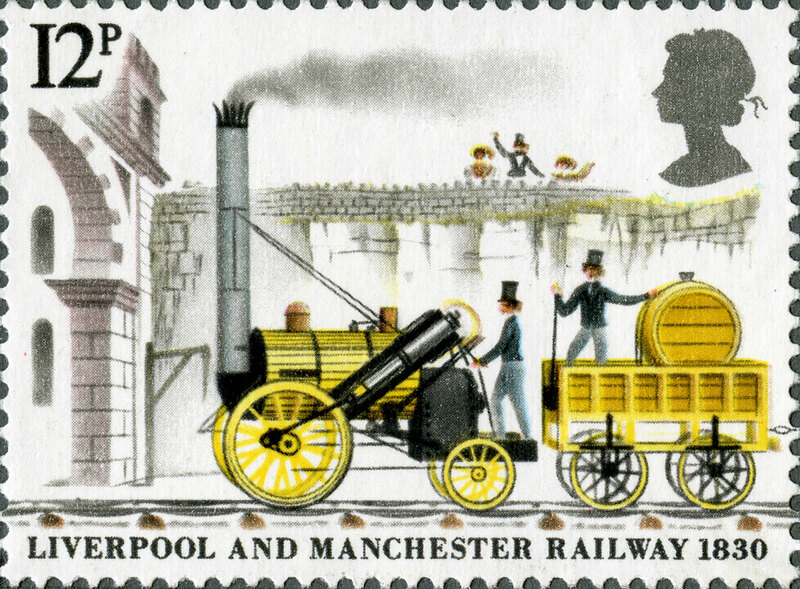 The post was first moved by rail in 1830 between Liverpool and Manchester. To mark the bicentenary of the initial mail coach test run Royal Mail issued a set of stamps on the 31 July 1984 depicting different mail coach routes. These stamps were engraved by a Polish artist Czeslaw Slania and maintain the look of a print engraving in their black and white colouring. The only hint of colour was used on the monarchs head. 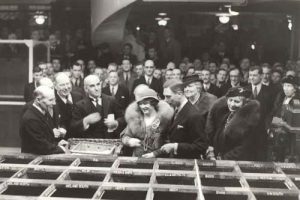 In 2016 Royal Mail celebrated 500 years of postal history with a large celebration and a stamp issue documenting their history. 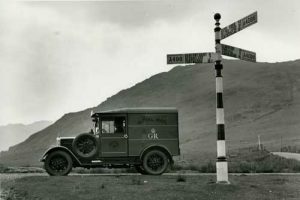 One of these stamps featured a mail coach and was taken from a painting we have in our collection ‘London to Glasgow Royal Mail on the Open Road’ in the style of Edwin Cooper. 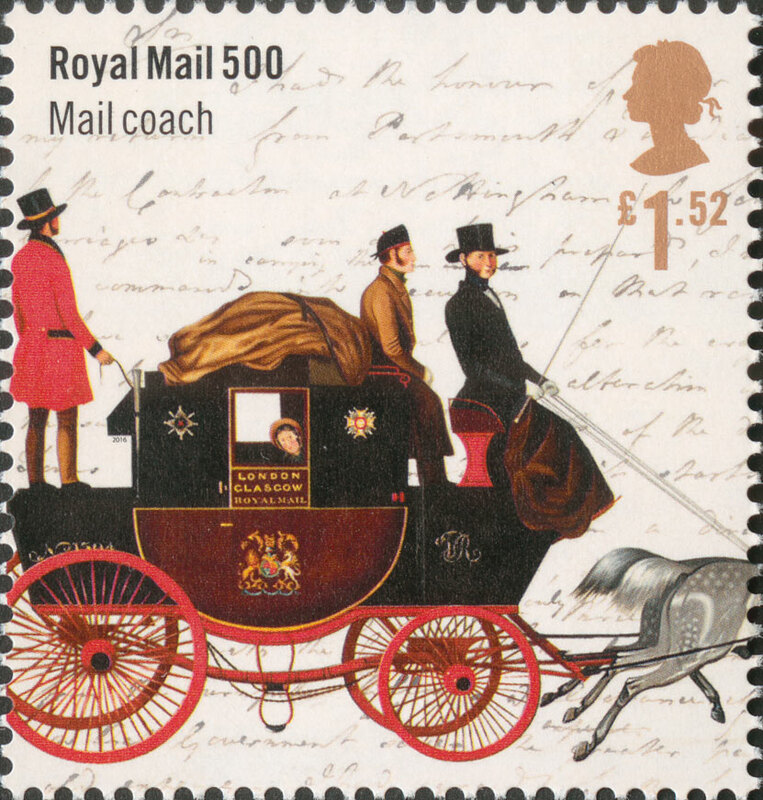 You will also see a mail coach featured on the Post & Go stamps of the same year, depicting transport methods of the mail from the original post boy to the Royal Mail minivan. The image below is of a mail coach from the 1790s with passengers at the front with the driver and the guard at the rear sounding the horn. Here at The Postal Museum, we have a collection of paintings looking at the iconic mail coach. I have chosen a few examples below to document the conditions in which the coaches travelled and the types of passengers and loads. 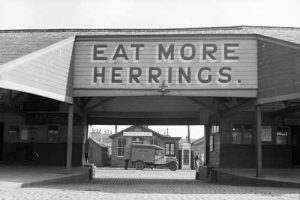 All of our public paintings are part of Art UK and have been digitised for the nation. OB1996.324 'A Halted Mailcoach' by Henry Alken Snr. OB1994.225/01 'Mail Coach in Snowstorm' by Samual Henry Alken. 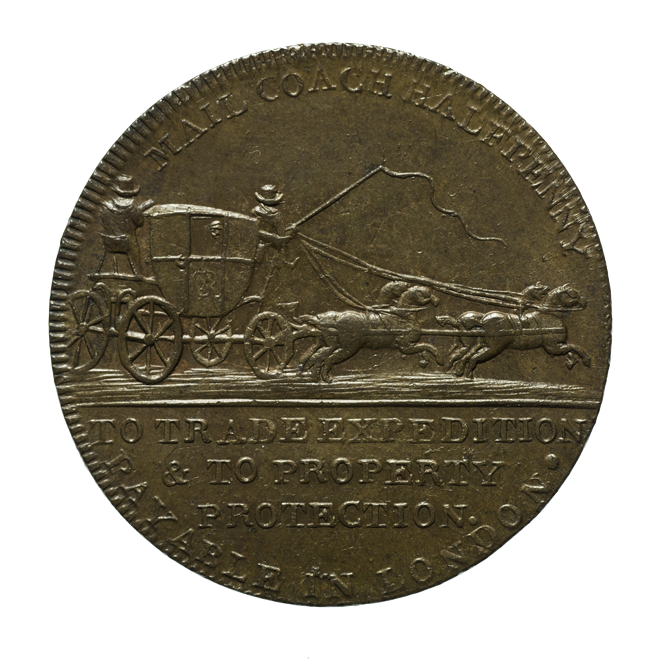 This brass halfpenny coin was issued to commemorate the achievements of John Palmer and the success of the mail coach. On one side is embossed ‘To J Palmer Esq. This is inscribed as a token of gratitude for benefits received from the establishment of mail coaches’. 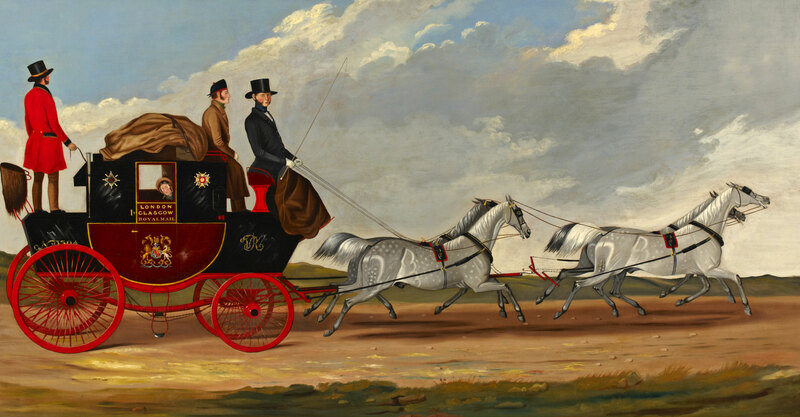 On the other is a depiction of a mail coach and four horses. 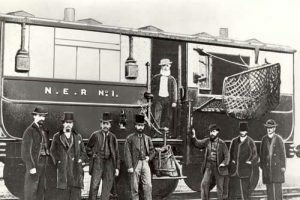 The mail coach was a revolutionary idea for the transport of the post and it was down to the ingenuity of John Palmer that the speed in which it moved only increased. As ever it had a time span and was later replaced by rail. 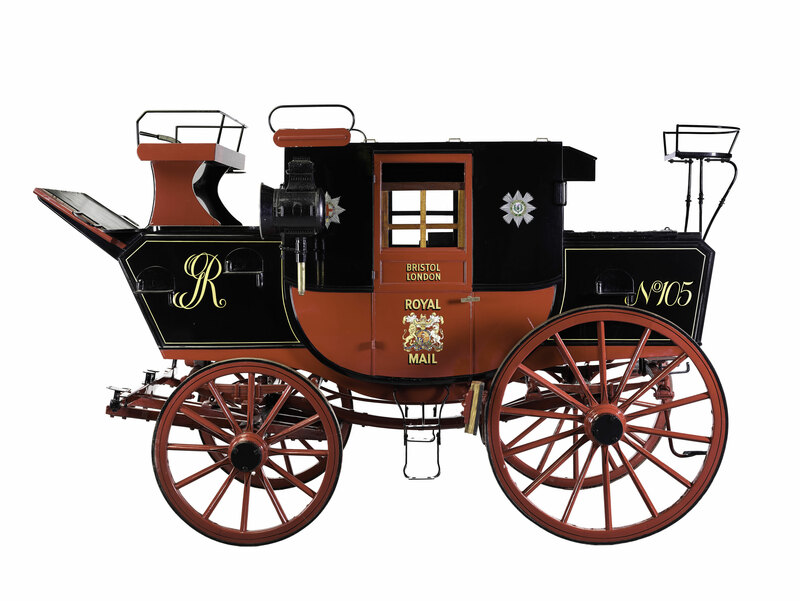 However, if you are interested and intrigued by the mail coach itself why not come and look at our mail coach on permanent display in The Postal Museum gallery.